I had a reservation to this hotel for a single occupancy room but they gave me the executive suite for no additional cost! It was in April, during the start of summer. The hotel was busy that day with what seemed like government-sponsored seminars. We arrived around 7:00PM - hours late for our check-in time. The receptionist was nice and brief. She asked us to wait while they are getting our room prepared. I brought my baby boy who was 6 months old at that time. He was getting a little fussy because he was sleepy. After waiting for not less than 20 minutes, we got our key and headed to our room located at the end of the hallway. When we opened the door, we were welcomed by a HUGE suite! I speculated that our room must have been given to another guest - since we didn't even call about our reservation earlier that day. Plus, maybe the lady didn't want to risk us getting snappy because we had a baby with us (who needs to go to bed ASAP). The executive suite gives you a taste of this hotel's 5-star rating. The room was very spacious and well-lit - it has a lamp on every corner. There was a minibar, a receiving area with TV, a small work desk (cable internet ready), a veranda overlooking EDSA and parts of Manila bay, a complete closet and a king-sized bed (with its own TV). Everything was clean considering the age of this hotel. The bathroom was spotless with complete toiletries, his and hers toilet, working hair dryer, a tub and a separate shower area. This was my first time to be impressed at such grandeur for a hotel room! What I liked about the room was the feeling of privacy despite the huge room area. I also liked the idea that the closet has a built-in vault, and an iron (with iron board) - I could have used those had I been somebody who checked-in for a conference in nearby SMX or World Trade Center. I loved the toiletries, too! They smelled like lemongrass? The only thing I didn't like about the room was the TV remote - it was just too darn old and there are no number buttons to jump to a specific channel. The location of the hotel is very accessible from the airport, maybe about 30 minutes from NAIA terminal 1. No wonder many major airlines book their crew here. I saw the crew of Singapore Airlines at 6AM in the lobby - all prepped! I wondered what time they woke up to create their prom-worthy updos. You're in busy EDSA once you step out of the hotel. It's a major highway thoroughfare so it's kind of polluted. But you are only a kilometer away from SM Mall of Asia, and about 25 minutes away from Makati (15 minutes at night/without traffic). And, oh! They have a Casino at the back end of the lobby. I can't say much about the service since we only stayed overnight. But I'd give credit to the floor's room service for calling on us in the morning to ask if we need anything. I think our room came with free stuff like the use of their business center and gym, but I didn't bother with it. Our room did have instant coffee and tea on the minibar, plus newspaper in the morning. The best thing I got from this hotel stay was the free buffet breakfast coupon. Sadly we only had one - so I went alone. 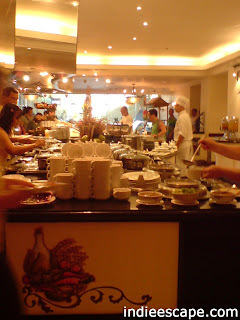 Heritage hotel's buffet menu was superb! It was so much better than I expected. They had plenty of choices from cereals, bread, Filipino to continental! Some of my favorites are the pastries, choose-your-own-toppings rice porridge and the fruits. Beverages are unlimited, too (except for fruit shakes). Don't ask me about alcoholic drinks or sodas though because I didn't check (it was morning!). Book your stay at the Heritage Hotel via Agoda here.